Super Mario Bros (1993. 1 hr, 44 min, 52 sec) is a fantasy film, directed by Annabel Jankel and Rocky Morton, based on the game of the same name. Oh, for the love of god! Who thought it would be a good idea to make this film? It’s not like the game had a lot of back story to rely on. Hoskins’s has been in many wonderful films, but this isn’t one of them, or at least not the best thing he’s done. Dennis Hopper (Koopa) on the other hand seems to appear in anything which pays. You can kind of see that in an era that made Ghostbusters this would have fitted in well and probably thought of more kindly. 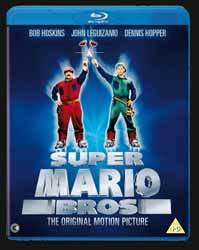 As it was, Super Mario Bros was a film out of its time and pitted against Jurassic Park, Mrs. Doubtfire and Schindler's List. Many of the successful film of that year were wonderful and the simplicity of Mario made the film feel as if it had missed its audience by ten years. If you forget when the film was made, it is not without its own charms and with the release of the Blu-ray fans can get to see the movie in it best format. Koopa’s plan relies on sending his two cousins, Iggy (Fisher Stevens) and Spike (Richard Edson) to capture Daisy, but of course they pick up the wrong girl. That’s what you get for sending morons to do a megalomaniacs job. When a leak happens near daisy’s dig site, Luigi and Mario fall through a crack between the two dimensions intent on rescuing Daisy. The 1.85:1 print is a little grainy, but this is usual in films of this era, the nineties version of our lens flare. Audio is a pretty decent 5.1 DTS-HD MA and LPCM Stereo. The big selling point, apart from the new print, is the extras. This ain’t no video Game (55 min, 48 sec) is a lengthy "making of", detailing the making of the film, including many writers, actors and production crew. It’s obvious that the film was made with the best of intentions and was aimed at children, not crusty adults, which probably explained much of the derision the film received from the critics. You also get the somewhat redundant Making of (17 min, 32 sec) which is the original feature and so presented in 4:3 and standard def. It’s more of an extended advert for the film, although it’s nice to see the contributions from Bob Hoskins, it also contains lots of shots of the film being made. The disc also contains the Original Theatrical Trailer (1 min, 36 sec) 4:3, standard def and not restored. You also get the original Electronic Press Kit (30 min, 05 sec) which is a series of featurettes designed to promote the film. Lastly we have the Galleries which contain twelve items looking at storyboards and effects. Looking back on the film now, it’s not as bad as I remembered, that said it was, overall, a little too late and a little too long for what it was. Still, it has a good heart and will probably still appeal to young kids.